Hollywood Temple will have one Kriyaban Ceremony this year on Saturday, May 4 at 7:00 p.m. in the Temple. The Ceremony is for Kriyabans who regularly attend Hollywood Temple. In order to make a reservation, please come in person to the Book Room to register. Be prepared to show your Kriyaban card when you register. Should you need a replacement Kriyaban card, please contact Membership Services at Mother Center by calling (323) 225-2471. It is customary to bring a flower, a fruit and a free-will monetary offering in an envelope. Flowers (but not fruit) will be available at the Temple on the night of the Ceremony, on a donation basis, starting at 5:15 p.m. Temple doors will open at 5:30 p.m. and we ask that all devotees please arrive before 6:45 p.m. so that you have enough time to make your offerings and be seated before the Ceremony. Temple doors will close promptly at 6:45 p.m. Please note that there will be no 5:30 – 7:30 p.m. individual meditation in the temple on this day. 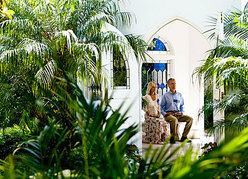 ​Welcome to the Self-Realization Fellowship Hollywood Temple's website! If you are new to Hollywood Temple and would like to learn more about us, please visit our Welcome page. Meditation is the science of﻿ reuniting the soul with the Infinite Spirit, God. By meditating regularly and deeply, you will awaken your soul — the immortal, blissful divine consciousness at the innermost core of your being. If you would like to learn more about meditation, visit our Meditation page for more information. 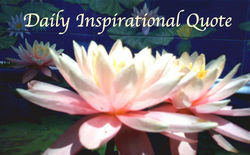 ​Every Thursday at 12:00 noon and every 1st Sunday of the month a short Introduction to Meditation is offered. See our Calendar for dates and schedule changes this month. Question About the SRF Teachings? If you have a question about Paramahansa Yogananda's teachings, you are welcome to submit it anonymously on our website, and a Minister will answer your question at an upcoming Satsanga Service. Monks and nuns of the Self-Realization Fellowship Prayer Council pray daily for all those who request prayers for physical, mental, and spiritual healing and for world peace. Hollywood Temple invites you to attend our conducted long meditations every Friday from 7:00 to 10:00 p.m. and Sundays from 6:00 to 9:00 p.m. The Friday meditations are with kirtan (devotional chanting). Meditations held in the Temple are open to all. 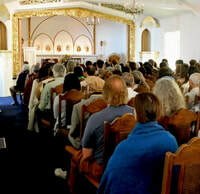 Participants are seated in chairs and are welcome to enter or exit during the period of chanting at the top of each hour. Group practice of the SRF Energization Exercises are held 20 minutes before the meditation service begins. Hollywood Temple is sponsoring a retreat for boys ages 6 through 12 here at Hollywood Temple on Saturday, April 27, 2019 from 9:00 a.m. to 3:30 p.m. Anyone wishing to learn how to meditate is welcome to attend the short Introduction to Meditation class held immediately after the second service in Lower India Hall from 12:10 p.m. - 12:40 p.m.
All are invited to attend a special service in the temple at 8:00 p.m. in commemoration of the birthday of our paramguru, Swami Sri Yukteswarji. We have come to a reciprocal arrangement with Kaiser. They will be providing free parking for our members on Sunday mornings and Commemoration Service evenings. 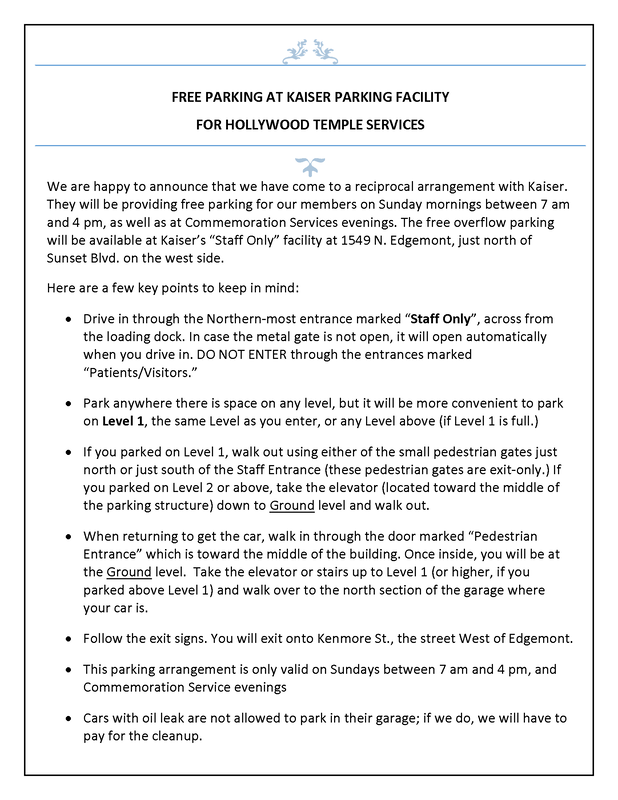 The free overflow parking will be available at Kaiser’s “Staff Only” facility at 1549 N. Edgemont, just north of Sunset Blvd on the west side. Use the Northern-most entrance marked “Staff Only”. For further important details, please click the adjacent image of the flyer announcement. In order to avoid our e-Newsletter arriving in your spam folder, add news@hollywoodtemple.org to your contact list or address book. If you are using Gmail and would like to ensure our emails arrive in your Primary inbox, instead of the Promotions tab, please read these instructions.